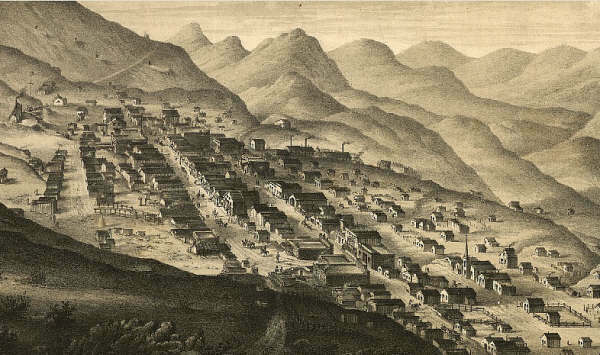 An excerpt from Roughing It by Mark Twain, this chapter from his time amongst the silver miners of Virginia City in the southwest corner of Nevada. He was in the thick of things in Virginia, arriving not long after the Comstock Lode was discovered about ten years after the California Gold Rush. Sam Clemens first used his pen name here in 1863 as editor for the Virginia City Daily Territorial Enterprise. Chapter LIII. Jim Blaine and his Grandfather’s Ram – Filkin’s Mistake – Old Miss Wagner and Her Glass Eye – Jacobs, the Coffin Dealer – Waiting for a Customer – His Bargain With Old Robbins – Robbins Sues for Damage and Collects – A New Use for Missionaries – The Effect – His Uncle Lem, and the Use Providence Made of Him – Sad Fate of Wheeler – Devotion of His Wife – A Model Monument – What About the Ram? “I don’t reckon them times will ever come again. There never was a more bullier old ram than what he was. Grandfather fetched him from Illinois – got him of a man by the name of Yates – Bill Yates – maybe you might have heard of him; his father was a deacon – Baptist – and he was a rustler, too; a man had to get up ruther early to get the start of old Thankful Yates; it was him that put the Greens up to jining teams with my grandfather when he moved west. Seth Green was prob’ly the pick of the flock; he married a Wilkerson – Sarah Wilkerson – good cretur, she was – one of the likeliest heifers that was ever raised in old Stoddard, everybody said that knowed her. She could heft a bar’l of flour as easy as I can flirt a flapjack. And spin? Don’t mention it! Independent? Humph! When Sile Hawkins come a browsing around her, she let him know that for all his tin he couldn’t trot in harness alongside of her. You see, Sile Hawkins was – no, it warn’t Sile Hawkins, after all – it was a galoot by the name of Filkins – I disremember his first name; but he was a stump – come into pra’r meeting drunk, one night, hooraying for Nixon, becuz he thought it was a primary; and old deacon Ferguson up and scooted him through the window and he lit on old Miss Jefferson’s head, poor old filly. She was a good soul – had a glass eye and used to lend it to old Miss Wagner, that hadn’t any, to receive company in; it warn’t big enough, and when Miss Wagner warn’t noticing, it would get twisted around in the socket, and look up, maybe, or out to one side, and every which way, while t’other one was looking as straight ahead as a spy-glass. Grown people didn’t mind it, but it most always made the children cry, it was so sort of scary. She tried packing it in raw cotton, but it wouldn’t work, somehow – the cotton would get loose and stick out and look so kind of awful that the children couldn’t stand it no way. She was always dropping it out, and turning up her old dead-light on the company empty, and making them oncomfortable, becuz she never could tell when it hopped out, being blind on that side, you see. So somebody would have to hunch her and say, “Your game eye has fetched loose, Miss Wagner dear” – and then all of them would have to sit and wait till she jammed it in again – wrong side before, as a general thing, and green as a bird’s egg, being a bashful cretur and easy sot back before company. But being wrong side before warn’t much difference, anyway; becuz her own eye was sky-blue and the glass one was yaller on the front side, so whichever way she turned it it didn’t match nohow. Old Miss Wagner was considerable on the borrow, she was. When she had a quilting, or Dorcas S’iety at her house she gen’ally borrowed Miss Higgins’s wooden leg to stump around on; it was considerable shorter than her other pin, but much she minded that. She said she couldn’t abide crutches when she had company, becuz they were so slow; said when she had company and things had to be done, she wanted to get up and hump herself. She was as bald as a jug, and so she used to borrow Miss Jacops’s wig – Miss Jacops was the coffin-peddler’s wife – a ratty old buzzard, he was, that used to go roosting around where people was sick, waiting for ’em; and there that old rip would sit all day, in the shade, on a coffin that he judged would fit the can’idate; and if it was a slow customer and kind of uncertain, he’d fetch his rations and a blanket along and sleep in the coffin nights. He was anchored out that way, in frosty weather, for about three weeks, once, before old Robbins’s place, waiting for him; and after that, for as much as two years, Jacops was not on speaking terms with the old man, on account of his disapp’inting him. He got one of his feet froze, and lost money, too, becuz old Robbins took a favorable turn and got well. The next time Robbins got sick, Jacops tried to make up with him, and varnished up the same old coffin and fetched it along; but old Robbins was too many for him; he had him in, and ‘peared to be powerful weak; he bought the coffin for ten dollars and Jacops was to pay it back and twenty-five more besides if Robbins didn’t like the coffin after he’d tried it. And then Robbins died, and at the funeral he bursted off the lid and riz up in his shroud and told the parson to let up on the performances, becuz he could not stand such a coffin as that. You see he had been in a trance once before, when he was young, and he took the chances on another, cal’lating that if he made the trip it was money in his pocket, and if he missed fire he couldn’t lose a cent. And by George he sued Jacops for the rhino and got jedgment; and he set up the coffin in his back parlor and said he ‘lowed to take his time, now. It was always an aggravation to Jacops, the way that miserable old thing acted. He moved back to Indiany pretty soon – went to Wellsville – Wellsville was the place the Hogadorns was from. Mighty fine family. Old Maryland stock. Old Squire Hogadorn could carry around more mixed licker, and cuss better than most any man I ever see. His second wife was the widder Billings – she that was Becky Martin; her dam was deacon Dunlap’s first wife. Her oldest child, Maria, married a missionary and died in grace – et up by the savages. They et him, too, poor feller – biled him. It warn’t the custom, so they say, but they explained to friends of his’n that went down there to bring away his things, that they’d tried missionaries every other way and never could get any good out of ’em – and so it annoyed all his relations to find out that that man’s life was fooled away just out of a dern’d experiment, so to speak. But mind you, there ain’t anything ever reely lost; everything that people can’t understand and don’t see the reason of does good if you only hold on and give it a fair shake; Prov’dence don’t fire no blank ca’tridges, boys. That there missionary’s substance, unbeknowns to himself, actu’ly converted every last one of them heathens that took a chance at the barbacue. Nothing ever fetched them but that. Don’t tell me it was an accident that he was biled. There ain’t no such a thing as an accident. When my uncle Lem was leaning up agin a scaffolding once, sick, or drunk, or suthin, an Irishman with a hod full of bricks fell on him out of the third story and broke the old man’s back in two places. People said it was an accident. Much accident there was about that. He didn’t know what he was there for, but he was there for a good object. If he hadn’t been there the Irishman would have been killed. Nobody can ever make me believe anything different from that. Uncle Lem’s dog was there. Why didn’t the Irishman fall on the dog? Becuz the dog would a seen him a coming and stood from under. That’s the reason the dog warn’t appinted. A dog can’t be depended on to carry out a special providence. Mark my words it was a put-up thing. Accidents don’t happen, boys. Uncle Lem’s dog – I wish you could a seen that dog. He was a reglar shepherd – or ruther he was part bull and part shepherd – splendid animal; belonged to parson Hagar before Uncle Lem got him. Parson Hagar belonged to the Western Reserve Hagars; prime family; his mother was a Watson; one of his sisters married a Wheeler; they settled in Morgan county, and he got nipped by the machinery in a carpet factory and went through in less than a quarter of a minute; his widder bought the piece of carpet that had his remains wove in, and people come a hundred mile to ‘tend the funeral. There was fourteen yards in the piece. Jim Blaine had been growing gradually drowsy and drowsier – his head nodded, once, twice, three times–dropped peacefully upon his breast, and he fell tranquilly asleep. The tears were running down the boys’ cheeks – they were suffocating with suppressed laughter – and had been from the start, though I had never noticed it. I perceived that I was “sold.” I learned then that Jim Blaine’s peculiarity was that whenever he reached a certain stage of intoxication, no human power could keep him from setting out, with impressive unction, to tell about a wonderful adventure which he had once had with his grandfather’s old ram – and the mention of the ram in the first sentence was as far as any man had ever heard him get, concerning it. He always maundered off, interminably, from one thing to another, till his whisky got the best of him and he fell asleep. What the thing was that happened to him and his grandfather’s old ram is a dark mystery to this day, for nobody has ever yet found out. This entry was posted in Mark Twain and tagged Mark Twain, Roughing It. Perhaps the precedent for Oracle Jones? Thank you so much for putting this Lalo ! e read this outloud at the dinner table laughing uncontrollably the whole way through.